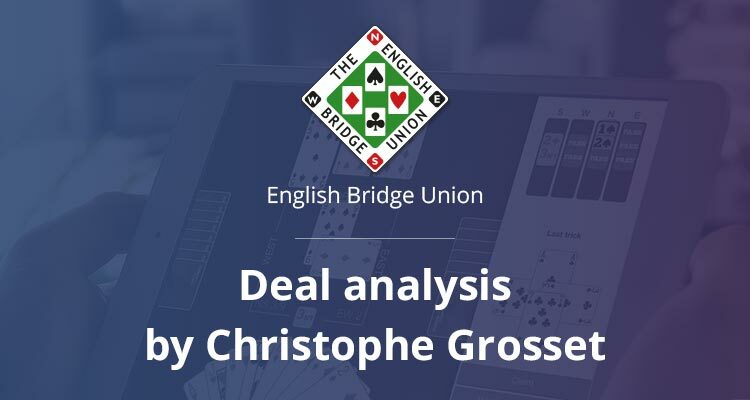 Christophe Grosset writes a column in the English Bridge Union magazine in which he makes a bridge deal analysis that he played on Funbridge. You can find below his latest bridge deal analyzed published in the February 2019 issue. The bridge game GOTO Bridge was created in 1994 by bridge enthusiasts who are now behind the Funbridge app. From the outset, they benefited from the wise advice and expertise of 2017 World Vice-Champion and professional bridge player Jérôme Rombaut who suggested innovations to meet bridge players’ expectations. The latest version – GOTO Bridge 19 – includes all the features which made the previous products so successful and popular,. There are unlimited deals and multiple practice game modes among other things. As before, no internet connection is required to play so you can take your bridge game with you everywhere you go! The bidding is quite straightforward. After South opens 1♠️, North showed slam interest with 3♠️ and then used 4NT to ask for keycards. When South bid 5♠️ with 3 keys cards (two aces and the trump king), North could settle in 6♠️. The lead is the ♦️Q. As one should always do in a suit contract, South counts his losers and ends up at two – the ♦️A and a diamond. As the heart loser is unavoidable, declarer needs to get rid of the diamond loser. The only option is to hope that West has the ace of hearts. You must lead the suit twice from hand towards dummy’s KQx to force West to take his ace without capturing an honour from dummy. The honour that wasn’t captured will be used to discard the diamond loser. There is a potential complication that may arise. Can you spot it? I’ll give you a hint, trumps are 4-0. You need to plan your entries carefully. If you play four rounds of trumps before playing a heart towards dummy, then when the ♥️Q wins (West ducks the first round), you will be stuck in dummy with no good play. If you then play a heart you will not establish your king, while if you play a diamond to your hand, the suit will be open and West will be able to cash a diamond after taking the ♥️A, all before you can establish the ♥️K. You must therefore play hearts immediately after realising that trumps break 4-0 in order to keep communication to your hand in spades. If you are interested by reading and watching more boards to improve your bridge, click here. Unless I’m missing something, there are several disconnects starting with the bidding shown above (i.e., it shows South bidding 5 Clubs, not 5 Spades), and the text (which indicates that the Ace of Diamonds is a loser when it is the Ace of Hearts that’s the loser). What is going on? 2. Ace of Hearts = loser, right!